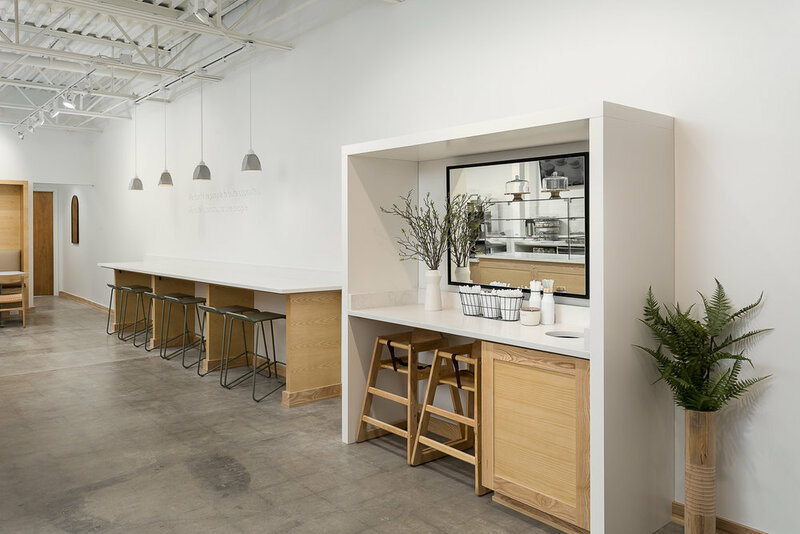 The St. Matthews location is the third location for Scarlet’s and builds upon the original design concept of the light and bright interior concept with emphasis placed upon the narrative of the organization. The St. Matthews neighborhood, is a busy area packed with a mix of residential and upscale retail and restaurants. The floor area is just under 1500 SF and the cafe seats around 37 patrons. 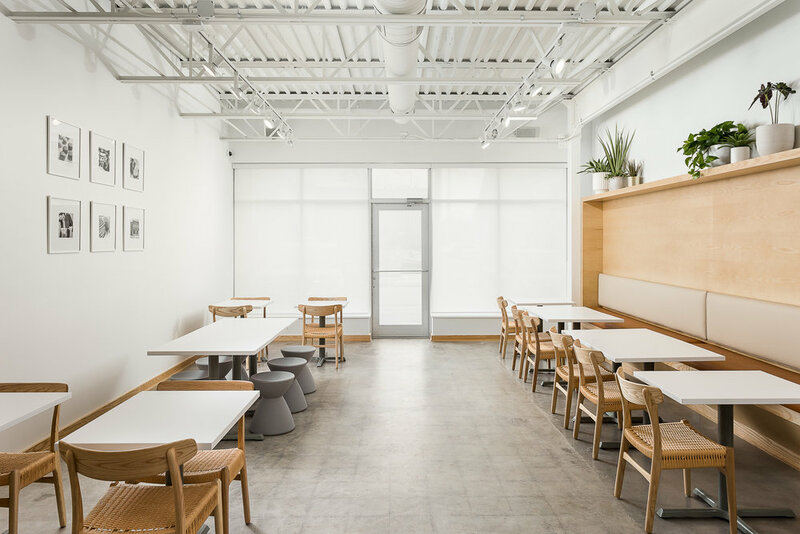 Since the space had few windows, we wanted to take advantage of the high ceilings and paint them bright white, to reflect as much light as possible. The rectangular floor plan and spacing of steel columns helped the floor plan naturally fall into place. 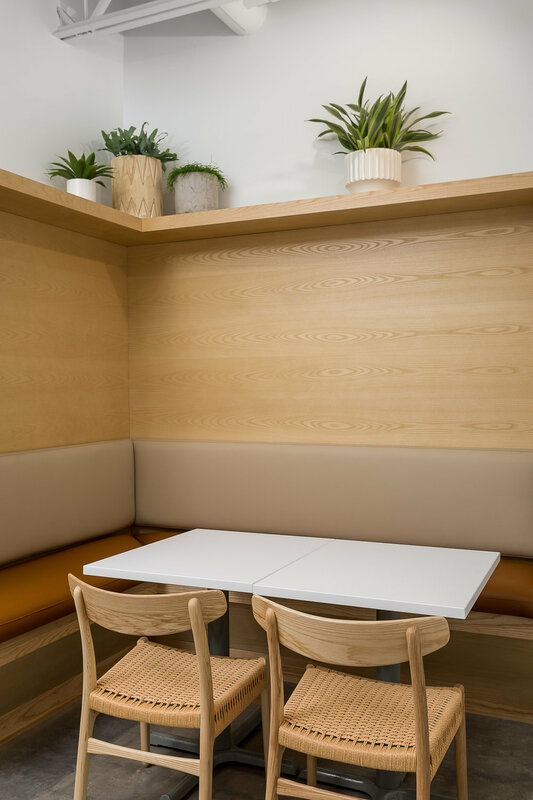 We filled the space with cozy booth seating, a WIFI bar and larger tables for groups. The materials from the original concept are repeated with ash-toned wood, white paint, glass, and concrete. Black and white photography, plants, and an understated mission statement reiterate the growth and restoration themes of Scarlet’s. 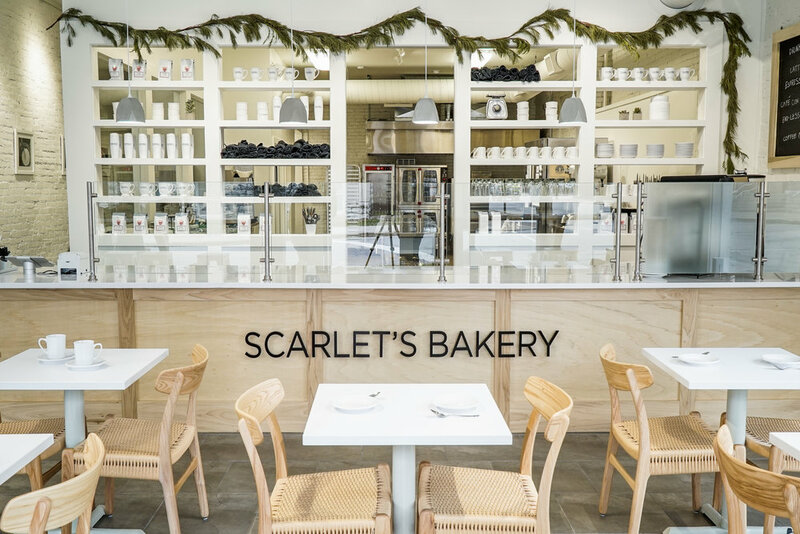 On a busy corner in one of Louisville's downtown neighborhoods, Scarlet's Bakery takes up the first floor of a renovated one hundred year old, building. The mission behind this bakery is as much about people as it is baked goods. The organization empowers women who have been previously exploited by teaching the employees transferrable job skills like baking and customer service. Find out more about their story here. The main concept for this space was a light and bright interior that symbolized new growth and restoration. Everything about the project is a story of revitalization and we wanted the interiors to correspond. Large windows allow a sightline from the cafe space all the way back into the open concept kitchen. 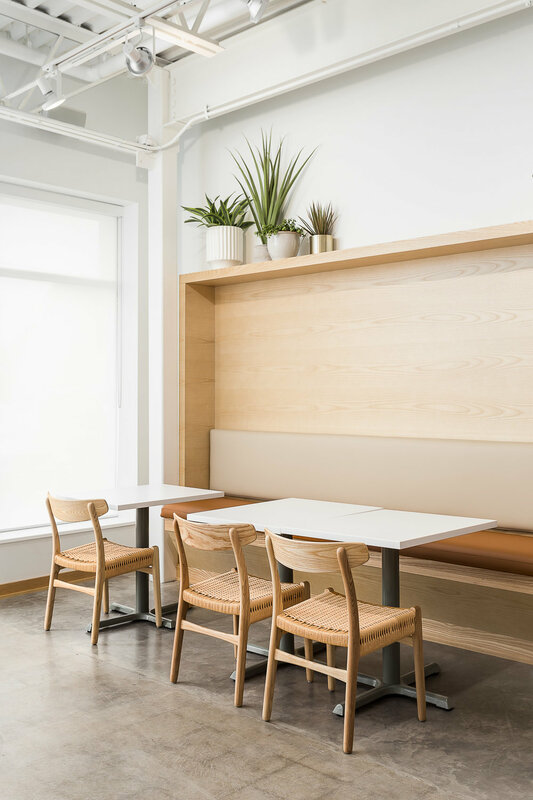 Light wood tones and walls give an airy femininity (a nod to the all female staff), but are balanced by concrete toned floors and cement pendant fixtures. With no historic value on the interiors, the space was a blank slate for the client’s Silicon Valley sensibilities. Access Ventures has been one of the driving forces behind the revitalization of the Shelby Park neighborhood. Their impact investing team focuses on both financial and social investments that create relationships, build businesses, and strengthen neighborhoods. 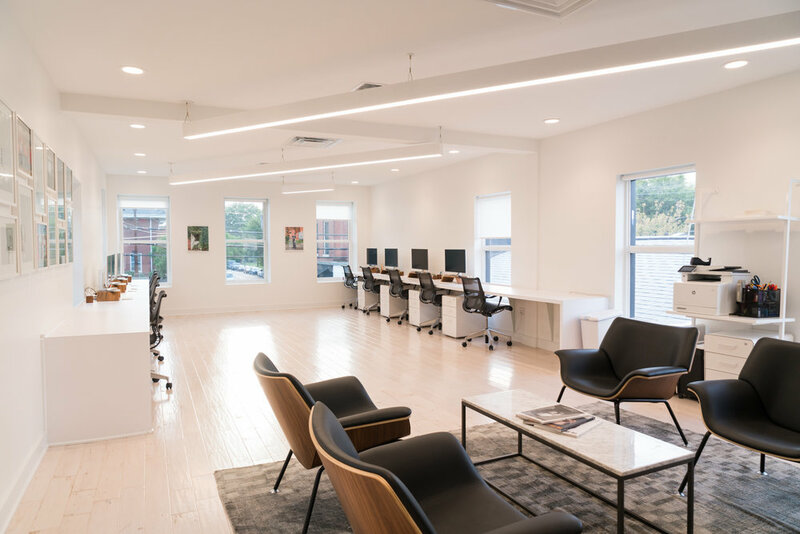 With their need for a permanent office space for the team and casual work culture, they selected a second floor space near a few of their investment properties in the same block. The mixed-use building is planned for rotating retail space on the first floor, while the office space on the second will be used for the client. Previously, the second floor was made up of multiple apartment units that were in poor condition. With little to no historic value on the interiors, the space was a blank slate. 739 was previously a dark, dated apartment that had seen better days. A new owner purchased the space to convert the old apartment into office suites. Since the old space had great architectural features (original fireplaces, high ceilings, and beautiful millwork) we wanted to strip down the layers of “improvements” that had been added on throughout the years and bring the space back to its former glory. A former glory with fresh twists.